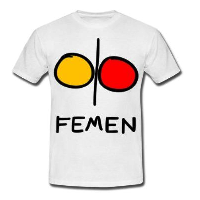 This entry was posted in EN and tagged news on February 10, 2015 by FEMEN. This entry was posted in NO and tagged nyheter on February 10, 2015 by FEMEN. This entry was posted in SE and tagged nyheter on February 10, 2015 by FEMEN. This entry was posted in IT and tagged notizie on February 8, 2015 by FEMEN. This entry was posted in KR and tagged 뉴스 on February 8, 2015 by FEMEN. This entry was posted in FR and tagged nouvelles on February 7, 2015 by FEMEN. This entry was posted in IT and tagged notizie on February 6, 2015 by FEMEN. Brüste auf Facebook: Stoppe die Zensur, Mark Zuckerberg! This entry was posted in DE and tagged nachrichten on February 5, 2015 by FEMEN. This entry was posted in FR and tagged nouvelles on February 4, 2015 by FEMEN.